I put this together to give you a quick primer into the social marketing work that I’ve done over the past several years. My career focus has primarily been on the creation and marketing of written and photographic content, but the strategic development of supporting social channels has almost always fallen under my purview. It's been one of the great pleasures of my professional career to be able to contribute to Moogfest's mission because its vision and values so closely align with my own. I could easily see myself making terrific contributions elsewhere due to my diverse work experience. My commitment to continued professional development means that I'm more than just a writer, photographer or digital marketing; it means that I'm a storyteller above all and I know a lot of different ways to tell the same story. Within my current position, my role in LIMU’s social strategy is to ensure all assets, blogs and other inbound content channels are on-brand and the messaging meets high standards. I have a knack for not only creating high-quality content from scratch, but for finessing others’ work to maximize messaging effect to drive conversions, hence the reason I was placed in a senior role in a short time. While our Social Media Coordinator handles the minutiae, I nonetheless have input into all stages of our content from conception to deployment. Additionally, I manage all of the company’s email marketing, tasking our designers with image creation to complement the copy I write and then build in Dreamweaver, before delivering to our audiences via IBM Marketing Cloud. I also manage our databases, as well as deliver regular statistical reports on our campaigns to LIMU executives. When I first began as music editor for YES! Weekly in 2008, it was a small operation with no single individual dedicated to managing the paper’s social channels. The editorial staff shared those duties, which led to inconsistent posting and lack of a unified voice, despite a wealth of content to share. I wanted to increase the paper’s engagement on Facebook to put more eyes on our work, so I worked with the managing editor to develop a content filing protocol to ensure that condensed social copy was included with every story submitted by the staff, along with a calendar for sharing them. The paper had roughly 6000 ‘Likes’ on Facebook at the time and grew to over 15,000 while I was there. Being in a position so closely aligned with entertainment, much of my work necessitated the creation of ad hoc marketing plans for the mutual promotion of the event or subject for which I had requested access. This gave me a practically unlimited stream of concert tickets, albums and other freebies for creating promotional campaigns on behalf of the paper, most of which I administrated jointly through social media and print as a driver from one platform to the other. We began Dance From Above as a quasi-underground House and Techno series to fill a gaping hole in the city’s dance music scene. Still going strong three years later, I handle most of its social marketing from afar, mostly through paid targeted campaigns on Facebook driven by the Facebook activity of many of our most active and passionate supporters. We decided to market Dance From Above via a more low-key, personable approach through social, rather than bombarding our audience with posts. We try to introduce ourselves to every new ‘Like’ that we see in person at our shows, so it’s not about the number, but of their individual quality and enthusiasm we generate from them. It also helps to ensure respect for the 100-year-old space that hosts our shows. This approach has helped the events steadily grow in number, and from a small upfront investment, we’ve reach full self-sustainability with a strong influx of outreach from booking agents representing anyone from Ninja Tune to Lobster Theremin artists. 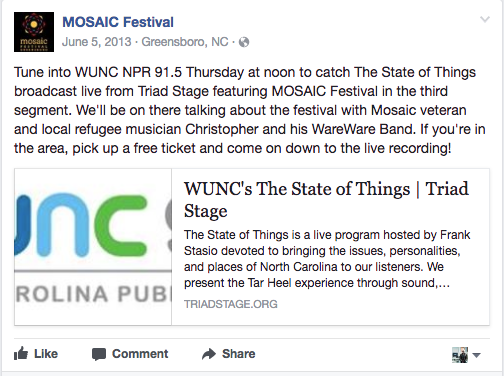 I’ve always had a passion for humanitarian work and community building, so working with a partner alongside an international refugee resettlement organization, we organized the MOSAIC Festival, which ran for five consecutive years as a free, day-long food and music festival. It was conceived as a means to highlight the fantastic diversity in Greensboro and create fellowship among its international and local communities through hospitality and entertainment. Over its five-year run, I oversaw the booking and marketing components, including creation and deployment of its social assets to create awareness of our mission, but also of the stories behind the international acts we presented. Some were touring headliners, but most were previously displaced locals with incredible talents to share. Our social plan involved engaging associated immigrant and refugee organizations, as well as our corporate partners, through highlighted posts, though our primary focus was to spotlight the refugees and immigrants in Greensboro who worked in the margins to share their cultures through art and cuisine.